Six p.m. closing of pubs was introduced as a ‘temporary’ wartime measure. It ushered in what became known as the ‘six o’clock swill’, in which patrons drank their fill before closing time. The practice was to last for 50 years. Since the 1880s the campaign for the prohibition of alcohol had developed into a powerful mass movement. Supporters promoted sobriety as a ‘patriotic duty’ during wartime, and in 1915 and 1916 nearly 160,000 New Zealanders signed petitions calling for six o’clock closing. The government agreed to restrict opening hours so as to increase the efficiency of the workforce. In 1918 six o’clock closing was made permanent. The liquor trade offered surprisingly little resistance. Its members felt that reducing opening hours had ‘drawn some of the sting out of the wider Prohibition movement’; it was certainly preferable to a total ban. In referenda held in April 1919 and alongside the general election that December, national prohibition was only narrowly defeated. The cause continued to enjoy strong support at the polls during the 1920s. Six o’clock closing became part of the New Zealand way of life. In the hour or so between the end of the working day and closing time, men crowded together to drink as much beer as they could before the so-called ‘supping-up’ time of 15 minutes was announced. 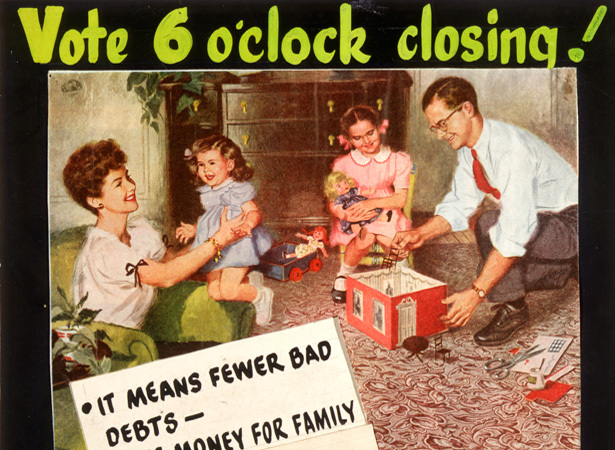 While early closing was promoted as a way of ensuring that men got home to their families at a respectable hour, critics questioned their condition when they did so. New Zealand’s binge-drinking culture has been blamed on the fact that six o’clock closing taught generations of men to drink as fast as possible. Six o’clock closing was decisively endorsed in a referendum in 1949. The first signs of a change in attitude came in the 1960s, when the expanding restaurant industry questioned laws that made it difficult to sell alcohol with meals. People socialising at the local sports club or RSA also sought a change to opening hours. As more tourists came to New Zealand following the arrival of jet air travel, early closing was increasingly seen as an outdated concept. In 1966 the Licensing Control Commission stated that uniform hours of sale were ‘neither equitable, enforceable, nor in the public interest’. In another national referendum in September 1967, nearly 64% of voters supported a change to 10 p.m. closing. We have 4 articles, related to 'Six o'clock swill' begins.